We've had a cut-up watermelon slowly disappearing in the fridge this week, so I went online to try and find a recipe that didn't involve booze (although that would be tasty) or the word "gazpacho." 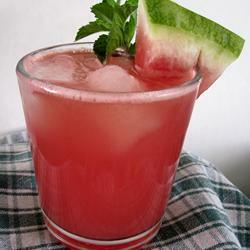 It should come as no surprise that I chose an easy recipe (the Lazy Cook) that involves lemons: Watermelon Lemonade. I didn't even make the lemonade from scratch or strain the watermelon (all that fiber! ); I just stuck my immersion blender in the container and combined that with already-made lemonade (concentrate from the freezer section - my fave).